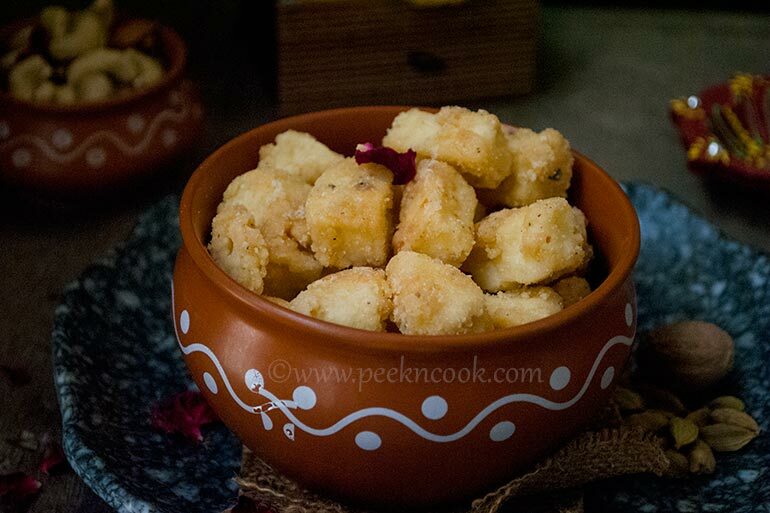 Chhanar Goja Or Chena murki is basically sugar coated paneer cubes. This is a very popular sweet of Bengal Odisa Bihar sides. The recipe of Chhanar Goja or Chena murki is very easy and quick. Take the paneer and cut them into bite size pieces and keep aside. Now take a wide non stick pan, add sugar and water to the pan and keep stirring to dissolve the sugar. Now boil the mixture till the syrup reaches one string consistency. Add milk and keep mixing with the syrup. Now lower the heat and add nutmeg and cardamom powder, rose water to the pan and give it a nice stir. Add paneer cubes and keep stirring to coat the paneer cubes nicely till the sugar syrup completely dried up. Turn off the heat, and dust icing sugar on the Chhanar goja or Chena murki if you wish. Your Chhanar goja is ready. Do use the nutmeg powder, this is the secret ingredient for such sweets.